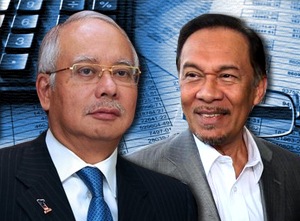 GE13: Who Owns People’s Aspirations? Knowledge is an asset which the more you spread it out, the more return you will get. When you hoard Knowledge, it will create pressure which is not good for your health and may drive you mad. It does not belong exclusively to any individuals or specific community, it belongs to all. This is the same case as the GE13 Manifestos issued by both PAKATAN and Barisan Nasional (BN). PAKATAN leaders are shouting foul that the BN Manifesto, Bringing Hope (Membawa Harapan) they claim, is copy of issues raised by them in their Pakatan the people’s Hope (Pakatan Harapan Rakyat). The most pertinent issue is that Who Owns the People’s Aspirations? The BN? PAKATAN? none of the above? – It actually belongs to the rakyat. BN and PAKATAN are just political entities and their manifestoes are the reflections of their perception of what the people’s aspirations looks like. The people will choose based on the comprehensiveness, cohesiveness and the inclusiveness of these manifestoes. It is not a question of who gives a better offer, because every offer made is at the expense of the people not the political parties. There is no point giving more and more financial handouts which may lead to higher inflation and eventually total economic collapse. There is no point promising the moon and stars when right from the on-set there is no intention or obligation to fulfill them. There is no such thing as plagiarism when dealing with people’s aspirations. It is how credible the BN or PAKATAN can translate these aspirations and how prepared are they to realize them. Each manifesto may look similar, after all BN or PAKATAN are Malaysians and each is trying to fulfill the Malaysian needs. This is where both BN and PAKATAN are caught with their pants down; to belittle the other is belittling your own self. Kudos to PAKATAN for leading in issuing their version of the people’s aspirations, but it is not perfect and does not cover all communities and all regions. In their haste, they overlook at the problem in Sabah, as the result they have to issue a supplemental PAKATAN manifesto for Sabah. Unfortunately, there is no supplemental manifesto for the Indian community; the Indian community is still left out. Similarly for BN manifesto which attempt to Bring Hope to all Malaysians, it falls short of addressing the issues in Sabah as well. The BN manifesto is too Malaya centric, it only serves Malaysians in Malaya, it overlook Malaysians in Sabah and Sarawak. Promising physical development in Sabah and Sarawak alone is not the answer. There is no point building 2,300 km of roads (highway?) from Samantan in Sarawak to Serudung in Sabah. For 50 years, Sabah and Sarawak only have 6,100 km of paved roads compared to 23,300 km of pave roads in Malaya. It will only benefit big time contractors from Malaya. The roads alone will not improve Sabah’s economy any better, when nothing is being done on the Cabotage policy. The Cabotage policy which has been in place since the 1980 is the main culprit which is chocking Sabah’s economy. How can BN spend RM680 million building retail shops like Kedai 1Malaysia, it will never reduce or stabilizes the prices of essential goods in Sabah, it will only enrich cronies. These retail shops still need to import our essential goods from Port Klang which means they still have to go through the Cabotage policy. Therefore, is BN coming up with another supplemental manifesto specific for Sabah, similar to those issued by BN in Kelantan? Is the BN in Sabah sensitive enough to translate the Sabah people’s aspiration and the prevailing economic conditions into a supplemental manifesto for Sabah? Or will the BN leadership in Sabah take the option to play safe and wait for instructions from Kuala Lumpur. We may as well vote SAPP as the government in Sabah, at the very least we have someone from Sabah to bang the Malaya tables.